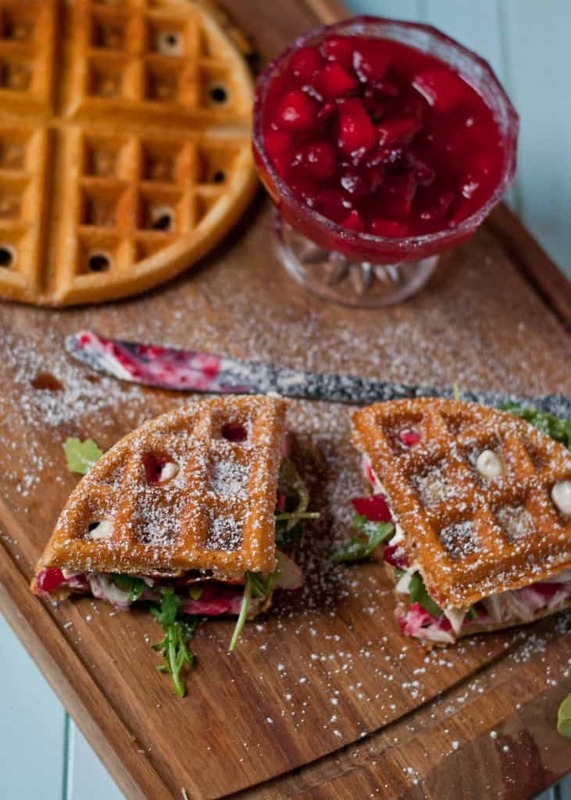 Make these sweet and savory Waffled Cranberry Cream Cheese Turkey Sandwiches with your Thanksgiving leftovers. Normally I have no trouble devouring Thanksgiving leftovers within a few days. Between stuffing topped with a fried egg, mashed potato bowls, and pie for breakfast (obviously), we usually have those leftovers polished off in no time. But this year I enjoyed a total of 4 different Thanksgiving dinners, each of which came with leftovers. Don’t hear this as a complaint. I mean, I LOVE a good leftover turkey sandwich on a Hawaiian roll with some Miracle Whip. But come Friday, I was over it. If we had any hope of finishing up those turkey leftovers, the sandwich was going to have to be reinvented. 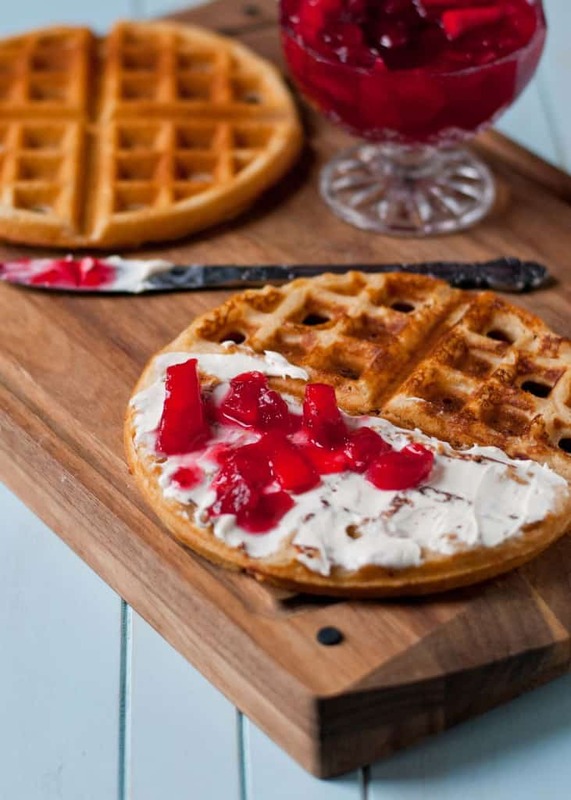 So reinvent we did–in the form of waffles, cream cheese, and leftover cranberry pear sauce. Consider this a Thanksgiving makeover of the classic Monte Cristo. 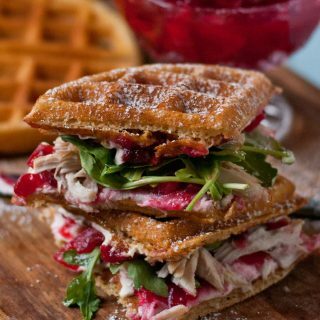 Crispy waffles sandwich a sweet and tangy cranberry cream cheese filling, turkey leftovers, and a bite of peppery arugula. Finished off with a little powdered sugar, these sandwiches are pretty enough to serve for a fancy brunch, but simple enough to enjoy for a lazy lunch. For those of you who get all weird when your meat and your fruit mix, I beg you, give this sandwich a try. The Mr. hates when fruit invades his savory food. Hawaiian pizza? No. Cranberry pork chops? No. And God forbid someone slip some mandarin oranges into his salad. But even the fruit hater had to admit he enjoyed this sweet and savory sandwich. I was really excited to find this recipe for whole wheat waffles from Faux Martha. They’re light and fluffy with a crispy exterior that’s sturdy enough to hold onto your sandwich fixins. This batter makes 6 waffles, which is enough for 12 sandwiches. If you’re not looking to feed a crowd, you can freeze any leftovers for a quick and easy breakfast. I’ve left the amounts for all the sandwich fillings blank, since it will depend on how many sandwiches you’d like to make. As a guide, I used one 8 oz. block of cream cheese and about 1 cup cranberry sauce to make all 12 sandwiches. 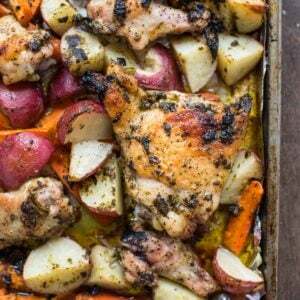 You can serve these at room temperature, but I prefer to assemble them then warm them up just a bit in the oven until everything kind of melts together. Perfection. 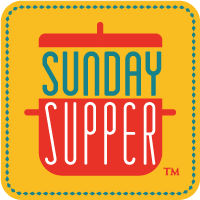 Today’s #SundaySupper has got you covered–from blankets of frosting and cheese, to recipes for gluten free desserts, no bake sweets, and ways to use leftovers– we’ve got you covered! Check out all the recipes below! Heat your waffle iron to high heat. Combine flour, baking powder, salt, and sugar in a medium bowl. Melt the butter in the microwave in a large measuring cup. Add the buttermilk to the hot melted butter mixture and whisk together. 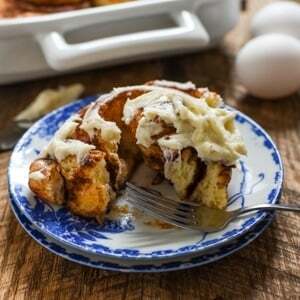 Whisk in the egg and vanilla. Add the wet ingredients to the dry ingredients and stir until just combined. The batter will be a little lumpy. Pour batter into the heated waffle iron until it just covers the outside edges (always better to err on the side of too little batter rather than HUGE mess on your counter). Remove waffles when they're browned and crispy on the outside and place in a single layer on a baking sheet. I got 6 waffles out of this batter, which will make 12 sandwiches. If you don't want that many sandwiches, you can wrap the extra waffles in saran wrap, place in a freezer safe bag, and save them for breakfast another day. Break the waffles into fourths. Smear cream cheese all over one side of the waffles, then spread cranberry sauce on top of that. Place slices of turkey on the cranberry sauce followed by the arugula. Top with another quarter of a waffle, then place the sandwich back on the baking sheet. Repeat with remaining sandwiches. Place the sandwiches in the preheated oven for about 10 minutes or until warmed through. Sprinkle with sifted powdered sugar, if desired, then serve. I totally want to eat this like right now! What a great, great, great idea!!!! Be still, my heart. First, your photos are seriously stunning. My mouth is watering just looking at them. This flavor and texture combination sounds spectacular! Well shucks. Thanks Katie. 🙂 You really can’t go wrong with waffles. That is the most amazing sandwich I have seen in a very, very long time! Just gorgeous, Courtney! Any sandwich that you sprinkle with powdered sugar is okay in my book. Dang those look good Courtney! I’m really regretting the lack of turkey in my house right now. And your photos are amazing, as usual! Haha, you and me both girl! I’m a total sucker for sweet and savory together! You just mixed waffles and turkey and I’m so happy you did because I just fell in love. SWOON! Wow – great way to use up leftovers and they look stunning! So festive! Thanks so much. I wasn’t even anticipating the cranberry and arugula creating the nice red and green contrast, but it worked! Now that is a great idea, super delicious!!! Ooooo! You’ll love it! Nothing like fresh waffles. Haha…I’m usually not either, but this year we had SO MUCH, it was necessary. Necessity is the mother of invention, right? Holey Socks!!! These look AMAZING! What a great use for the leftover cranberry sauce too! This might just be the most creative way to use up leftover Thanksgiving food that I’ve seen. Waffles! Awesome! My husband would be all over this sandwich! He loves cranberry with his turkey! This looks absolutely fantastic…Making tomorrow!! Yes! Come back and let me know how you liked it! I’m totally one of those weird people that don’t like when fruit and meat mix. But there have been exceptions in the past, and this might just be one of them! You and my hubby would get along just fine. 🙂 But really, it convinced him, so there’s a chance! Haha yeah, I’ll look at it that way! If only I wasn’t running short on posts for the remainder of THIS year. Sigh. haha. I just ate and I’m hungry again. 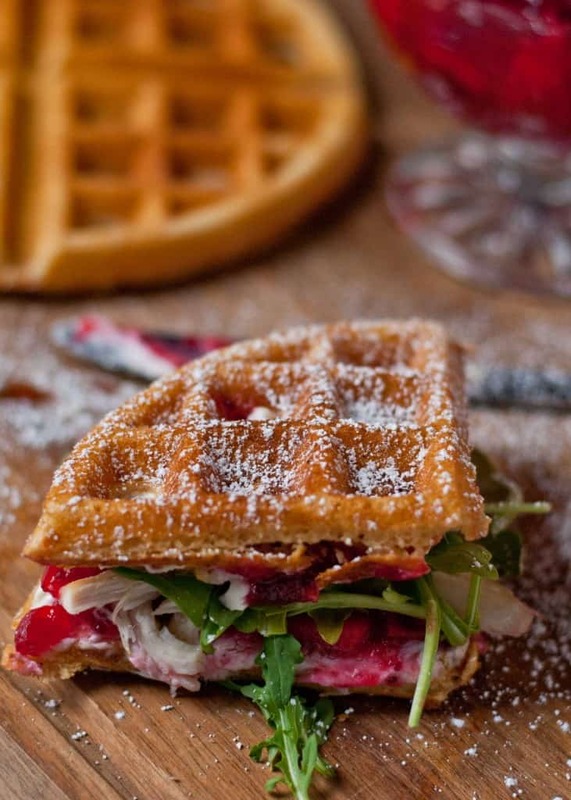 You have no idea how much I love turkey, sandwiches, waffles, oh just everything in this recipe. Wow. Pinned. 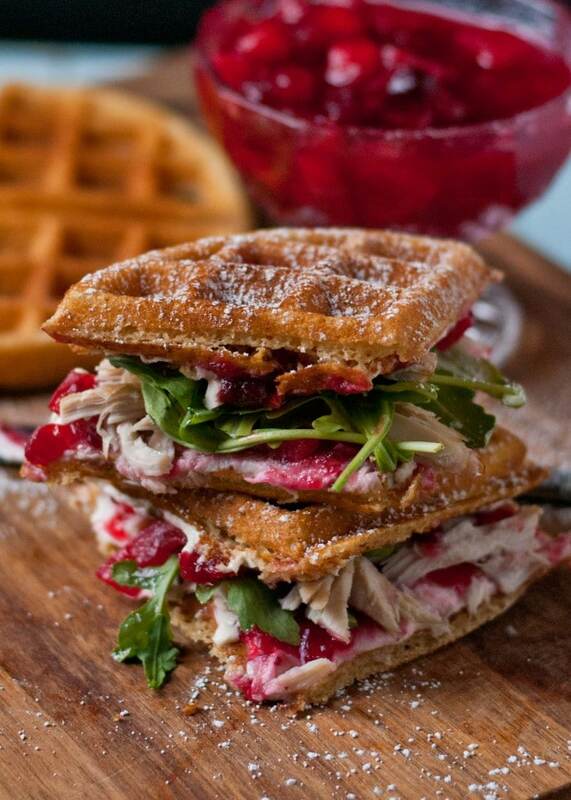 I love this combo of a waffle with the turkey cranberry and arugula for a little bite. Wish I had thought of this growing up! What a glorious sandwich! Got any leftovers?! ooo Courtney! I want to make another Turkey just so I can have these!